Nordic cross-skating (also cross-skating, cross inline skating, cross blading) is a nordic sport on nordic cross-skates (find here) whose popularity is increasing rapidly. Subsequent there’s a short information about the cross-skating sport and about many positive effects of it. Nordic cross-skating developed from a combination of cross-country skiing, inline skating and roller skiing. The pieces of sports equipment – the nordic cross-skates – are skates with pneumatic tires which you can use on paved roads or even off-road. There are cross-skates that have a kind of binding (similar to a snowboard binding) where you can use your own shoes (e.g. Powerslide XC-Skeleton). Professional cross-skates have installed a solid shoe that mostly resembles an in-line skating shoe (e.g. Powerslide XC-Trainer). Both cross-skates are equipped (usually on the right skate) with a calf brake that can be attached in addition to the other skate. For nordic cross-skating you can use cross-country-skiing poles or special cross-skating poles, which should be slightly longer because of the high of the cross-skates. A higher rolling resistance of the pneumatic tires and various underground makes this necessary. The use of poles in addition to the leg-work activates a variety of different muscle groups. 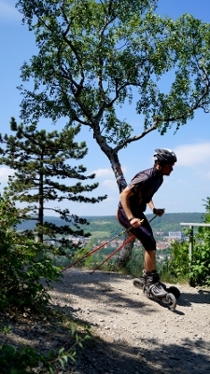 Similar to xc-skiing sports, cross-skating and also roller skiing are the forms of movement with the highest energy consumption. Therefore nordic cross-skating is against obesity and high blood pressure and elevated blood sugar levels. But it also offers advanced sportsman the opportunity to force up the level of performance and expand conditional capabilities. It is always advisable to wear a helmet (e.g. a bicycle helmet) to protect from head injuries. To prevent elbow and knee injuries use knee guards and elbow protectors. Gloves help against getting blisters on your hands and in case of falling against graze. Whether in groups or alone, nordic cross-skating is suitable for all friends of exercise in a wide age range seeking a new sport and those who like to go off road. Just a trip on lonely roads in harmony with nature, your worries will be forgotten for a short time. It is possible to find emotional balance while cross-skating.